Learn how to Draft your Fantasy Betting MMA team here! Whatever word the fighting world has come up that is the opposite of a glass-jaw, we should also place a picture of Gustafsson next to it. This guy stood in the octagon with Jon Jones for five-rounds and took it on the chin the entire round. He can basically do anything you need him to do. He’s a lean, and long striker with the ability to submit his opponents if needed. Gustafsson is going to want to stay on his fight and engage in a striking war with Cormier because thats the way he can win. My advice is just that. Stay on your feet and you win this fight. Cormier can strike but not with Gustafsson. Work on that take down defense, and move around and make Cormier chase you, then strike. Cormier is the Champion, I don’t care what anyone says about Jon Jones. Cormier has followed the rules and paid his dues to be called a champion of the UFC. This is going to be one of the toughest fights of his life though. I stated earlier that Cormier doesn’t want to get into a brawl-like match but that need to be with an asterisk. 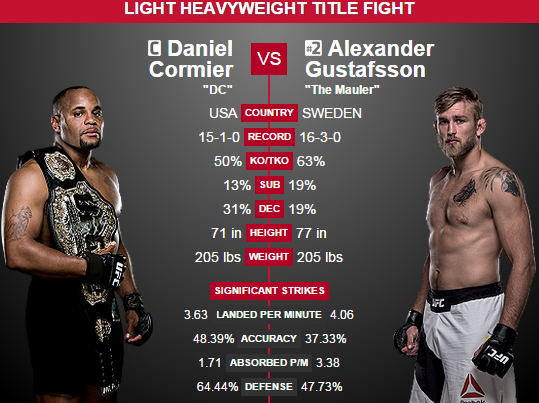 If Cormier can get Gustafson to the mat, he needs to just pound away, thats how he is going to win. He knows he can stand or match up with lean strikers, and thats a epitome of what he is going to have. He needs top come in with a plan of how to get Gustafsson to the ground. I don’t see just taking shots at the legs working as well as it would against a less formidable opponent. Cormier needs to grapple, slam this guy to the ground, and finish him off as fast as possible. The championship belt isn’t going to be changing hands in UFC 192. Cormier is going to weather the storm at the beginning, slam Gustafsson to the ground and just beat him. This is going to be a referee stoppage in the third round. Cormier is going to maintain the belt and stand on top of the 205-pound class.